Quirepace Pneumatic Tube Systems (PTS) are used to transport small payloads with a weight typically up to about 5kg. Items to be transported are placed within a carrier and then moved within a tube using air pressure and suction. Whilst the principle is straightforward, delivering reliable, robust and complex installations requires experience and knowledge. Quirepace Pneumatic Tube Systems are available in a wide range of sizes and models depending on the application. Systems range from simple “Point to Point” installations that might, for example be used to transport paperwork from an office to a manufacturing area, or a brewery sample to a testing laboratory, to enormous installations with literally miles of tube and hundreds of stations found, for example, in the UK’s largest Hospitals. 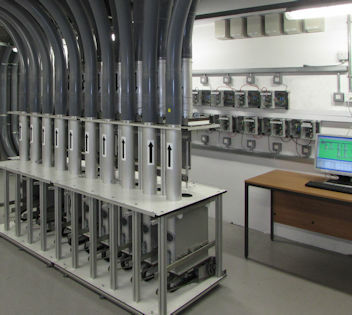 The installation of a Pneumatic Tube System is a specialist trade combining elements of construction, plumbing, electrical and data network installation. Whatever the application, every Quirepace Installation starts with careful design to ensure the performance of the equipment provides the correct solution to meet our customer’s requirements, followed by installation by Quirepace’s experienced Installers and Project Managers, and concluding with testing, demonstration and handover. All equipment, of course, is provided with warranty, and after-sales support via Quirepace’s nationally based team of service & maintenance technicians. The combination of Quirepace’s specialist knowledge and expertise, the proven technology of moving a carrier within a tube using air pressure as the motive energy, our carefully designed stations and components, and our powerful microprocessor and computer control and information systems, means that Quirepace Pneumatic Tube Systems deliver the optimum solution for moving small payloads efficiently, securely and reliably. Contact our Sales Team and find out how we can help you.